Yiğit Mengüç, assistant professor of robotics and mechanical engineering, works at the interface of mechanical science and robotics to design deformable “smart” materials for building soft-bodied devices and robots. Among his goals are to design and manufacture soft, bioinspired robots for tasks such as deep-sea exploration and to augment human capabilities in everyday life. “The last five decades have been dominated by rigid robots, but the future will be characterized by soft robotic devices that are physically compliant, exceptionally dynamic, and ever-present in our daily lives,” said Mengüç who is the director of mLab (for mechanics, materials, and manufacturing). Inspired by nature – particularly the octopus – Mengüç is designing and creating mechanisms that are as soft as skin and muscle. One such material, for example, changes from a liquid to a pliant soft solid when subject to high voltage, then reverts to a liquid when the charge is turned off. That ability to control the phase transition has enabled him to create tiny arteries inside of soft bodies that can be opened and closed using electric fields. Mengüç joined Oregon State in 2014 after his postdoctoral fellowship at the Wyss Institute for Biologically Inspired Engineering at Harvard. He received his B.S. in mechanical engineering from Rice University in 2006 and earned his M.S. and Ph.D. in mechanical engineering from Carnegie Mellon University in 2009 and 2011. His work on soft marine robotics earned him the prestigious Young Investigator Program Award from the Office of Naval Research in 2016. In one project, funded by DARPA, Mengüç used a 3D printer to extrude inexpensive, off-the-shelf silicon rubber fluid into seamless soft bodies with complex geometries and internal voids. Previously, achieving that result would have required molding two halves of a device, then joining the parts together to create a finished assembly with empty space sealed inside. “This is a very exciting development, because we’re a step closer to printing soft-bodied robots with gaps of any shape and dimension that we want on the inside,” Mengüç said, adding that the finished pieces can stretch to almost 900% of their initial dimensions. “Soft robots essentially work by pumping air or liquid into voids inside their bodies to create the kind of motion you want,” Mengüç explained. “We can dictate the shapes it takes by restricting and guiding how it inflates, so we can make a soft body curl or perform other motions.” With the initial phase of the project work complete, Mengüç has moved on to experimenting with new production techniques, such as combining the rubber with liquid metal or printing it directly into a water bath to create even more complex shapes. 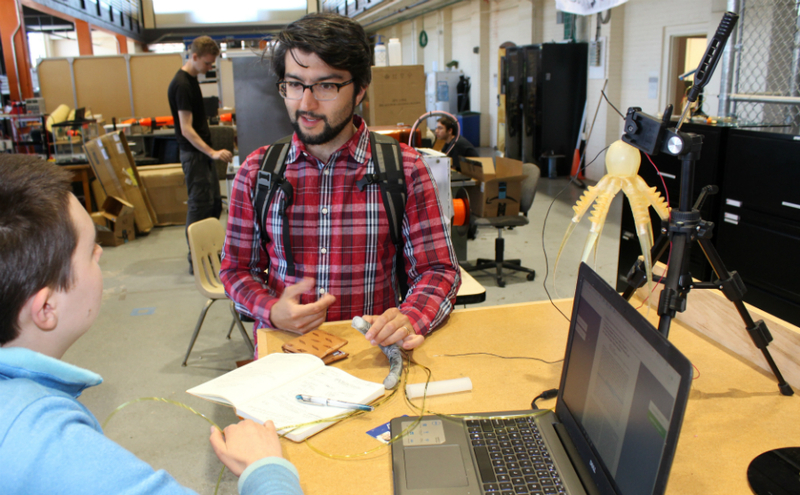 In a second project, funded by the Office of Naval Research, Mengüç is using 3D printing to build soft arms that can perform the complex motions of octopus tentacles. In humans, antagonistic muscles – biceps and triceps – define the arm’s movement up and down. But boneless octopus tentacles are equipped also with longitudinal, circumferential, and oblique muscles that allow a great deal of flexibility and range of motion. “It’s a level of complexity that’s completely absent in human architecture,” said Mengüç. “We want to build a robot arm that has some aspects of the octopus’s architecture. To control movement, we’ll pump liquid into internal spaces whose size and shape are controlled by electrical fields. Ultimately, we want a robotic arm that can twist, reach, grasp and do other complex motions.” He envisions a role for such robots in deep sea exploration, where a soft-bodied device can withstand the crushing weight of the water column. “It would be much less expensive and more versatile than using submersibles,” he said, “and being able to directly print them is critically important to their future viability.” Additional funding sources for his work include Intel and Hewlett Packard. In the classroom, Mengüç endeavors to help his students make connections between abstract engineering principles and real-world applications and problem solving. When working with his graduate students, he emphasizes the importance of considering why the work they’re doing is important. “That starts at the beginning of a project and asking, ‘Okay, what’s the problem and why should we bother to solve it?’ Then I want them to break the problem down into smaller, more manageable chunks,” said Mengüç. Posted in facultyspotlight, mimenews, news.